Ah, the old Strathearn Pub, we hardly knew thee. You definitely won’t be missed. An eyesore on the neighborhood, filled with some fairly questionable clientele, and being shut down for running drugs through the bar? Not the type of thing that the actually pretty nice Strathearn neighborhood needed. Sure, there were some crazed nights of poor decisions there, but really, the area deserves something better than a poorly run, sketchy, cocaine-trafficking pub. Enter the Juniper Cafe & Bistro, who have recently opened their doors after revamping the space formerly occupied by the bar (9514 87 st). Walking in to the Juniper, it is hardly recognizable as the old Strathearn. Which is definitely a good thing. They have gone through great pains to completely revamp the space, and now instead of a dank pub where the bigger fear is getting stabbed over quality service, the Juniper is a bright and airy cafe, lined with small tables and a walk-up counter to place your order, filled with delicious-looking treats. At first, the Juniper had some small growing pains, such as not taking debit when they opened, or only having photocopies of the small menu, or not having their liquor license in place, but those are hiccups that small businesses have to deal with. Upon return visits, they have definitely been ironing out the kinks. I was unsure at first, since the food was a combination of things I never really cared for. Then I absolutely devoured it. It was delicious. They wanted feedback on their food, and I provide it happily here. It was one of the best breakfast sandwiches I have ever had. So, it would definitely be worth the price. As for the other things I’ve tried, the scones are delicious. Blueberry and rosemary? Good. Raspberry and white chocolate? Good. A simple cup of coffee? Good. The Juniper has been all hits for me so far, and I look forward to the short stroll from my place to them on the weekend, to pick up something to snack on. I truly hope that the Juniper is able to succeed in their location. It is a quiet spot, tucked away from the main traffic of the city, but it serves as a great little local cafe. Each time I have been in there, it seems to be doing good business so far, which is great to see. With an incredibly friendly staff who truly care that you like their food and their place, and increasing efficiency each time I’ve gone in. It will be a place that I will visit, whether it is for a meal, or quick coffee. If you’re in the area, stop by the Juniper. It is a nice little place for those who have never been around Strathearn before, and a shock to the system for those who remember the days of the Pub, or actually dared to step inside there. Best of luck to the Juniper, and I hope that they are around for a long time, so that I get the chance to eat more of their delicious stuff! Any time there is an item on a menu simply called “Bacon”, I am sold. Tzin Wine and Tapas in Edmonton (10115- 104th street, right by the Blue Plate Diner) is a tiny hole-in-the-wall wine bar that can hold about 30 people at a time in a warm setting in the downtown area. What is provided here is a nice atmosphere, a very friendly staff, a cozy setting, and some good wine selections. For food, Tzin doesn’t have an extensive menu, which is nice, and should be expected. 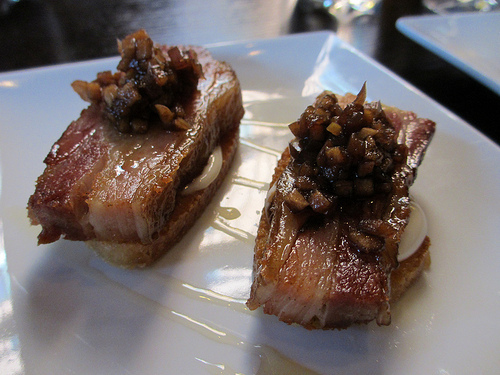 It is tapas style, serving small portions so that you are able to try a few different things. And from my experience, those different things are quite tasty, and perfect for sharing. We ate the Bacon and the Shrimp (I just love the simple names! ), and both were very delicious, providing some tasty snacks in between sips of the main star of Tzin, which is the wine selection. A very good selection of both reds and whites should do the trick for wine lovers of all sorts. There isn’t much in the way of description of the wines, which would have been kind of nice, but it is more a place for someone who knows what kind of wine they like, and would like to try something that you can’t always get at the local Liquor Depot. The prices aren’t bad, although Tzin isn’t exactly the kind of place one would go to if they were on some kind of budget. For two appetizers, and two glasses of wine each, the bill came to $100. Not insane, but not somewhere that could be frequented on a weekly basis on my income. But for the time there, it was well worth it. The wines we tried were both delicious, and we both really liked the food that we had. The cozy atmosphere was quite nice, and despite the proximity of the tables to one another, it does feel like there is some sort of privacy. Even though they may be a couple of feet away from you, it is not like you have to hear every word that your neighbors are saying, and there is no need to up the volume on your conversation because the other people are too loud. It is quite nice. Tzin’s decor definitely looks like a wine bar. The cramped quarters, the heavy velvet curtain upon entering the main door, the friendly server, all adds to the atmosphere of Tzin, and helps make it a pleasant evening there. This is not a restaurant where I would recommend going for a full meal, but it is a good place for an after-work drink, or a quick bite and glass of wine with friends. It can also serve as a good date location. There is nothing but positive things to say about this place, and I would definitely recommend it, as well as frequent it again myself. 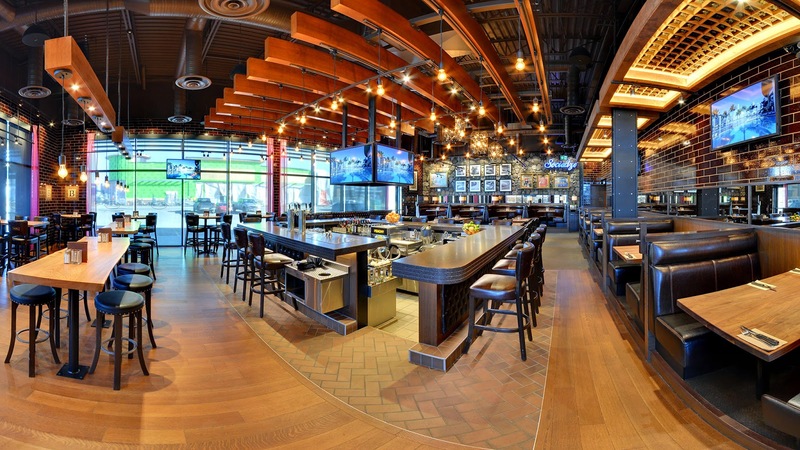 The growing trend in Edmonton of hipster-styled pubs trying to be social gathering places continues, as Browns has now moved into the ever-expanding Windermere neighbourhood. The idea of being a social hall, or social club, or social hall, or place to meet new people and have a good time is all the rage right now in the city, but it can already be seen that the idea is getting severely watered down, and this is no more evident than it is at Browns Socialhouse. The idea of the Socialhouse is to have long tables, where you are sitting next to people you have just met, affording the opportunity to meet new people, and make new friends. It is about the intermingling of people from all different walks of life, brought together over food and drinks. Browns Socialhouse makes an attempt at this, with a couple of larger tables in the picnic-style tradition of a social hall, but they are only made for about 10 people, making it ideal for a large group of people that already know one another. Not for the mixing idea that these pubs are based on. The rest of the restaurant is the usual selection of booths and individual tables, which are oddly spaced out, leaving large gaps in the floor plan, and keeping patrons away from one another, as with any other restaurant. The social aspect of this Socialhouse is missing right off the bat. Browns comes across as much more of a chain than these other places do (even if they themselves are chains as well). It reeks of a normal, suburban restaurant, and misses the eclectic mix of patrons that a social hall should have. It also has many elements of a new restaurant, glitches that need to be worked out in order to improve the customer experience, in my opinion. The food is good. It is not unlike anything you can get at pretty much any new restaurant in Edmonton, but it tastes good. The fries are tasty, and the sandwich that I had was quite good. But, like I said, it is barely different than the fare found at so many other places now. Their lager is quite good, and is only $5 a pint. This is a good price, considering the astronomical beer prices at places like Craft. There is a spacious patio, which is semi-enclosed, making it usable during all types of weather. That is about it for the positive side of things. As mentioned before, Browns seems like a new restaurant, and there are many things that they could improve on in order to make it a better place, and help it gain a foothold as a good neighbourhood restaurant and bar. The menu is nothing special, and doesn’t really offer anything too original. It could easily be swapped out for the menu at Craft, Original Joe’s, or even an Earl’s, and nobody would be able to tell the difference. Some places in this style of restaurant, such as the Next Act or the Sugarbowl, pride themselves on an interesting and original menu. Browns has a good selection of pub grub, that was tasty, but ordinary. The beer menu is severely lacking. On tap, they have only a few standards. There is nothing unique or original about what they serve. One main point about these craft style beer houses is to have a great selection of beers, isn’t it? Getting a pint of Stella doesn’t really count as something new and interesting. The wait staff needs to calm down. My friend and I were, no joke, asked if we were ready to order food six times before we had even looked at the menus. Every couple of minutes. I guess they don’t offer the luxury of hanging out and talking with friends for a while before getting food. Simply put, it was extremely annoying. I get the attention to the needs of the customer, but asking that often is simply ridiculous. We can order when we are looking for a refill on our drinks. In the end, we ordered our meals with barely looking at the menu, simply because we felt rushed and inconvenienced by the incessant asking. While they clearly wanted us to eat, there was oddly a wait for getting drink refills. Once the food was served, we were asked another six times, by more than one staff member, if everything was alright. The waitress seemed extremely surprised, or confused, that we ordered water with our beers. 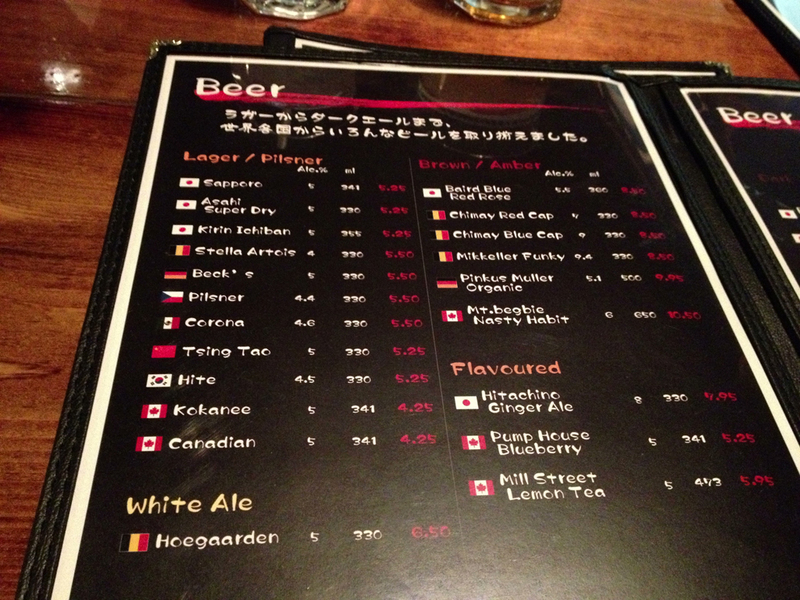 The waitress demonstrated an alarming lack of knowledge regarding the beer selection. She was not aware of what an IPA was. Now, neither my friend nor I are big snobs when it comes to this kind of stuff, but we figured that a Socialhouse would have a staff that is well versed in what they have on tap, and would be able to show a knowledge of the variety of beers they served. This could have been the one waitress, and not common to the rest of the staff. I don’t want to generalize the entire group of employees. It could also be due to the newness of the place. But it was strange that she didn’t know the beers. She also struggled with remembering what was on tap. I don’t blame her, and in the end she was a good waitress, but this is something that could be worked on a little bit. The decor looks like pretty much every other restaurant in Edmonton at this point. Very little stands out. The half-patio is kind of odd. It would be really nice if it was fully open, but it is understandable why it isn’t, with the strange weather in this city. It had an odd vibe, and the acoustics made it sound hollow, like you were eating in a hallway. Browns Socialhouse could become a very good option in the far south of the city. Windermere sometimes feels to me as though it is in the middle of nowhere, far away from downtown or Whyte Avenue. Browns is unique to that area. But there are far better options in the city if one is looking for this kind of environment, that would offer a highly knowledgeable staff, a great selection of beers, and a social atmosphere: Next Act, Underground, Central Social Hall, Craft, Local, The Common, to name a few. 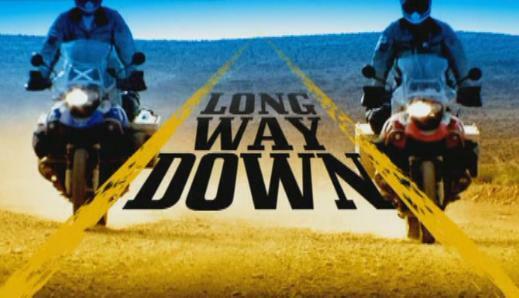 With a little work, Browns could vastly improve itself and perhaps make it worth the drive out there. For now, it is a place that comes across as too common, and too ordinary, to warrant a trip out to the Windermere area, when there are so many similar options closer to the heart of the city. I didn’t hate Browns in the least. It offers beer and food, so I am generally happy. However, it is not my favourite place, and it is not a place that is on my list of places I simply must go back to. If I’m in the area, sure, it is an option. But that’s about it. I’ll be the first to admit that I am extremely picky about Japanese restaurants. Having lived in Japan, I want it to be as authentic as possible, without having to absolutely break the bank in order to get some good sushi, and other delicious Japanese cuisine. In Edmonton, there are some very solid sushi restaurants. Many of them will annihilate your wallet before leaving, and others will leave you with a reasonable sushi experience, but nothing great. 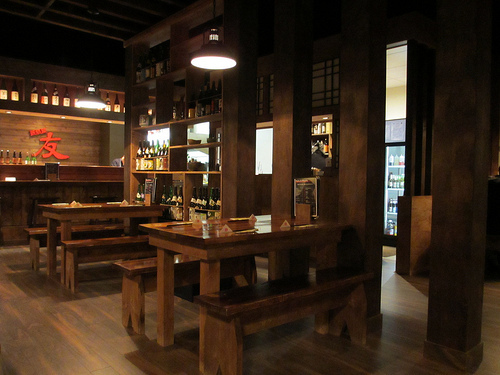 Prior to going, I had heard nothing but positive things about Izakaya Tomo, located on 99th Street, near 34th Avenue. It is pretty innocuous in a small strip mall next to a hot yoga joint. Walking in, Izakaya Tomo provides a genuine izakaya feel. It’s not hidden booths and crammed with tables like many Western restaurants, but open, and filled with picnic-style tables, similar to the styles that would be more commonly found in Japan. The decor has it down, and if anything, that is a really good start. There is an excellent selection of alcohol, including a good variety of beer and sake, and although the menu is not massive, there is a nice selection of Japanese fare to be had. Sushi, rolls, some rices, along with some traditional hot dishes make up for a good opportunity to do some sampling. The best part about izakayas in Japan (izakaya simply means “pub style”) is that there is always a variety of food, and it is cheap, so that you can order a bunch and share. It is not typical to order yourself a meal. The idea is to order a ton of things, get to sample a little bit of everything, and pay a small price for each dish. Izakaya Tomo does most of this right. Some of the prices are a bit high here, and it is definitely easy to rack up a pretty impressive bill. Such is a problem with getting “foreign” cuisine at Western prices. People are willing to pay it, so there is no reason that it needs to be cheaper (for example, an order of maki rolls will set you back about $4.50, whereas this is generally filler food in Japan, usually to be had for little more than a dollar per order). But, the food is worth it. Everything that we tried as a group, was good. The negitoro was beyond delicious (to the point where we went through five orders of it), and the rolls were excellent (except for the California rolls, which used imitation crab, similar to what you would find at Safeway, making it the only disappointing thing about the restaurant). The fried rice was good (especially the one with the pickles in it- seems weird, but trust me). The okonimiyaki-style dish got rave reviews. The gyoza was solid. 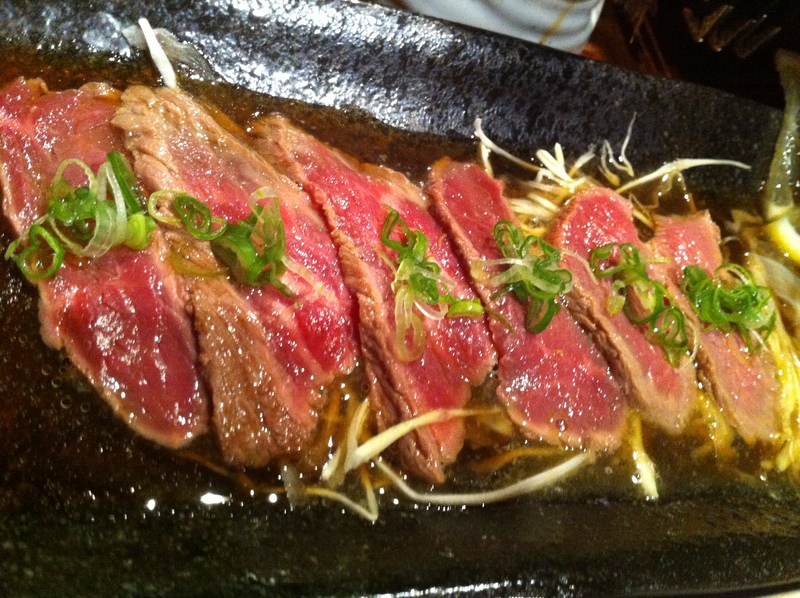 The beef tataki was fresh and full of flavour. The fish was fresh and tasty, making it a very good meal. The atmosphere inside is nice, to along with the good food. 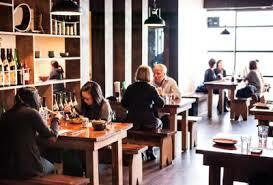 It is a fun, laid back place, with a good hubbub from the customers, and a nice buzz to the place. In the end, there were five of us, and we racked up a bill of over $170, including drinks (can’t say no to the massive beers!). At about $40/person, we ate until we were full and had enough drinks to keep us happy. Not the best deal in the world, but still, it is nothing out of the ordinary for dining out in Edmonton, especially on Japanese food. And again, the food is absolutely worth it. Izakaya Tomo is now my favorite Japanese restaurant in Edmonton. It comes the closest to recreating the pub experience in Japan, the food is good, it’s a fun place to go, and despite the perceived high prices, it is really no more expensive than any other sushi joint in town. I would definitely recommend Izakaya Tomo for anyone in Edmonton looking for a good evening, good drinks, good food, and a relaxed atmosphere. It’s difficult to choose a restaurant in Tokyo to choose to review, since there are just so many of them. 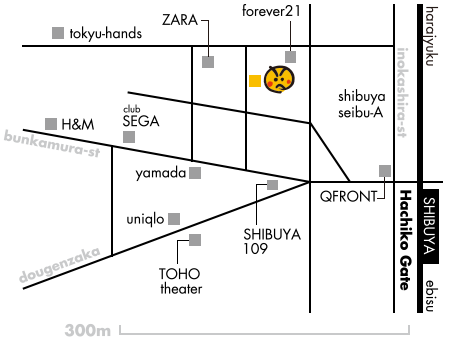 It has to be one that people will specifically make an attempt to visit, and Genki Sushi, in the Shibuya district, is just that. 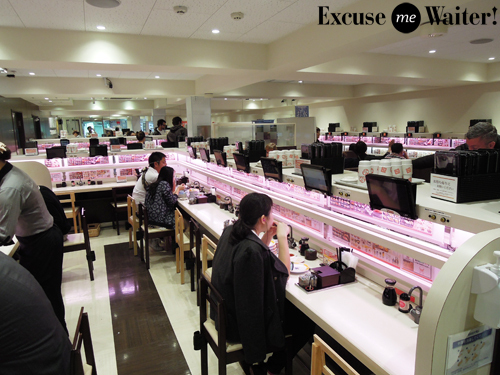 A take on kaiten sushi, where plates of sushi pass you by on a conveyor belt, and you simply pick the plates that you want to eat and are charged based on the number (and colour coded prices) of plates that you eat, Genki Sushi makes the kaiten experience even more…Japanese. 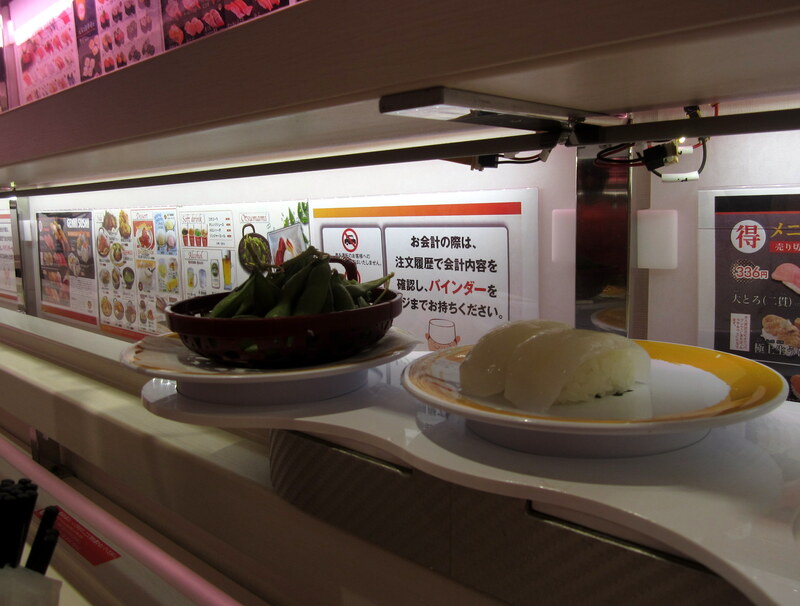 Might as well make the sushi eating experience a little more futuristic. At Genki Sushi, once you have found it, lined up with the other foreigners who want to try it out, and found a place at either the plentiful counters or few booths (for larger groups, there are about 3 booths that can seat 6 each), you start to scroll through the computer screen, where you can build up your own orders. You are able to order 3 items at a time, and once you have selected your food, you get to wait for the fun part. It comes to you on a trolley on a conveyor belt. I have to admit, it is pretty fun to see your food making its way towards you, at a pretty quick speed, on a little table that is like a train that brings sushi. Taking your plates from the trolley, you push a button to send it back, and then dig in and enjoy. You are able to make as many orders as you like, but only 3 items at a time. The sushi menu itself is pretty expansive, and you will struggle to find a kind of fish that you want, and not see it on the menu. Many Westerners tend to enjoy the rolls quite a bit, as they are some of the most common elements on North American sushi restaurant menus, and there are a few choices here. But the main draw is the fish itself. Typically, kaiten is your low end option for sushi. It is fast, and cheap, and gets the job done. Genki Sushi is simply better food, for the same price, along with fun put into the whole thing. The choices are strong, the sushi is good, and the entertainment value is second-to-none. It is very possible to eat a large sushi meal here for under $15. Again, it all depends on how much you want to order. On my first visit, 4 friends and I created a pile of plates as tall as we were (seated), had some drinks, were full by the end of it, and it cost us each about $12. You can’t beat that. There are some especially delicious choices on the menu that you won’t find at a regular kaiten restaurant: the trout is excellent, as is the mackarel. There are also some “grilled” salmon options (meaning they’ve spent a couple of seconds under a blow torch), that come with onions and mayo that are quite delicious. It makes sense why Genki Sushi has become such a popular place among Tokyoites and foreigners alike. It is good, cheap food, with a unique twist. This is something that we simply do not have back home (although apparently there will be a Genki Sushi opening in Seattle soon), therefore making it a destination place in the heart of Shibuya. Considering the hundreds of restaurants in the area, it is pretty easy to find, and well worth it in the end. Genki Sushi was good enough that I took the time to make more than one stop there, and was satisfied with each trip. Delicious. Panorama Mountain Resort, just outside of Invermere, British Columbia, is a favorite ski spot for its very consistent conditions, and beautiful mountain village. 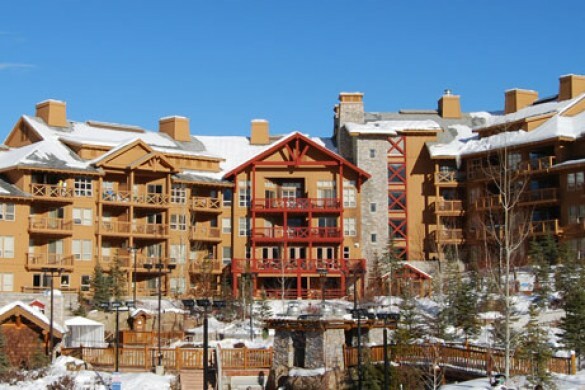 With a ton of condos right on the hill, or (worse case) just a short gondola ride up a hill, everything is close and within reach in the village. There are a handful of very good restaurants and the Great Lodge always makes a good place to relax after a few hard runs down the hill. This year, the ski conditions weren’t at their best, as Panorama needs one thing right now: a massive amount of snow. Most runs were open, and generally, there was decent snow coverage, with only the occasional rock or exposed chunk of land, but it really could use a big dump to get a little bit of powder going, to cover up the icy spots and return Panorama to its normal skiing glory. 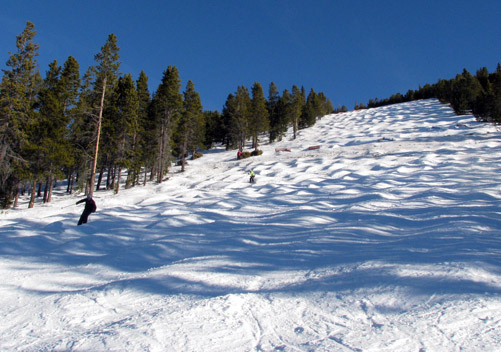 The resort does well with what it has, having the runs nicely groomed for each day on the hill, and one of the best features of the mountain is that each run is generally big enough that you are able to find a route down that is relatively untouched, or without traces of ice. Despite our concerns for the lack of snow, it provided a couple of days of very solid, if unspectacular, skiing. 1. There is no longer hot breakfast being served in the Great Hall until 11 AM. This came as a bit of a surprise, since it had always been busy in there for breakfast before. In fact, the Great Hall served no more made-to-order meals, instead relying on churning out burgers and fries and having them sit under heat lamps until they are grabbed by a customer. This created a lot less traffic in the cafeteria area, since it was always a very long wait for food before, but it does create a lower quality meal. 2. Employees tend to be very confused on the locations of things that probably should be a part of their job. It took me asking three different employees where the Ski Patrol station was, so that I could check on an injured student. None of them knew where it was, and I had to rely on some good wandering in order to find the place. I had just assumed that people who worked there would know where certain things were located. I was incorrect. 3. The condos at Panorama are always very nice. They all have nice, large balconies, and are quite spacious, and have rooms available for various sizes of groups. This year, a couple of the rooms were not as prepared as they could have been, or have been in the past. Missing bedding for pull-out couches became hard to come by, and there was more than one instance where there was a lovely stash of smelly garbage in a room. These are small things that can be easily remedied by housekeeping and guest services. We were happy to be in the perfectly located Panorama Springs building. 4. This year, Panorama has changed their ideas around for storage, insisting that no skis or boards enter the rooms. They now provide lockers on the first floor of the building where you can store your stuff. But this raises a few issues, with one locker being assigned per room. The lockers are the size of your typical high school locker, meaning there is little chance of fitting a snowboard in there, let alone six. At best, you could get two pairs of skis in there, but nothing more, and even that requires a degree in engineering to figure out. Locks are provided by the front desk, with a $20 deposit if they are not returned. Somehow, this new locker usage feels like a money grab, since it provides far more inconvenience that needed. I see no issue with leaving skis and boards on the balconies of the rooms, as it has always been done before. Another issue is that the locks have the combinations attached to them on a small, easy-to-lose card, which of course could lead to a whole other whack of issues. Panorama is a definite favorite spot for skiing. This year, it was not perfect, but perhaps that is more to blame on mother nature and her refusal to snow much this year. The weather was absolutely perfect, hovering near the freezing mark for much of the time. It offered a perfect day outside, and warm enough to sit outside on the large patio at the Great Hall, to enjoy the spectacular views, some good times, and some good skiing. I will always recommend Panorama to others as an optimal place to ski. 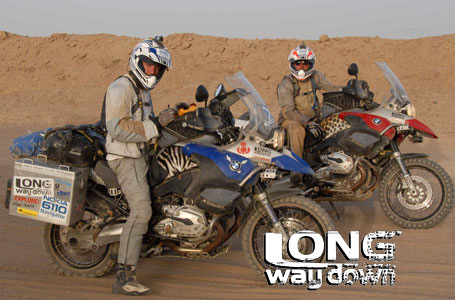 Despite the little foibles that we found this year, it is still a great place to go. Maybe wait, and be sure to check those snow reports, before heading out.